September 29, 2016, 3:07 PM · As a child learning to play the violin in Shanghai during China's Cultural Revolution, Vera Tsu Weiling hid in a dark basement to practice, using sheets of music copied out in pencil, always with the fear of being discovered and gravely punished. She never could have imagined where she would be a half-century later: back home in Shanghai, sitting among some of the most distinguished violinists in the world - now her colleagues - in a new hall built for the Shanghai Symphony (conducted by her husband Long Yu), serving on the jury of the first-ever Shanghai Isaac Stern International Violin Competition. Though she has represented China on juries for many of the most prestigious violin competitions in the world, this one had particular meaning for her. "Before, I couldn't even dream of all these people in my own city, and also being a judge in an international-level competition," she said. "We were so isolated in China: no music, no recordings, no live performance, no idea what real music is. And now, we have our own competition, bringing so many great musicians together in this city. This changes things tremendously." Weiling's musical journey took her around the world, to study with Dorothy DeLay and Rafael Bronstein, to play as a soloist at Carnegie Hall, and to be associate concertmaster for the Hong Kong Philharmonic. 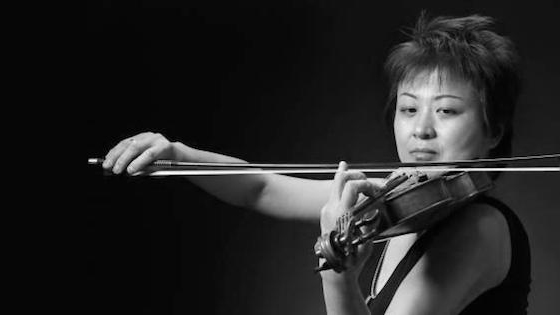 Now she is one of the most sought-after violin teachers in China, teaching at both the Central Conservatory in Beijing and the Shanghai Conservatory. While in Shanghai, I spoke with Weiling about what it was like to learn to play the violin during the Cultural Revolution, being one of the first students to be admitted to China's Central Conservatory afterward, Isaac Stern's 1979 visit and the state of Western classical music in China today. Vera Tsu Weiling was born in Shanghai in 1960. Both of her parents were amateur musicians; her father, an electrical engineer, played the violin; and her mother, a doctor, played the piano. She was not forced to play the violin by her parents; she wanted to learn. "One day, as my father was going out, I stopped him. I was three, and I said, 'I want to play the violin.' And my father said, 'No, no, you are too little to start the violin.' I said 'No, I want to do this, please!' And he said, 'Okay, let's make a deal. I'm going out now, and if you can hold the position like you're holding a real violin, until I come back, then I will get you a violin. Okay?'" Her father left, and naturally, he forgot their deal. "So I was just standing there, for hours! As long as it took," Weiling said. "Finally he returned, and I was still standing there. My face had turned green by then!" she laughed. "He couldn't believe it. So I got a small violin, a one-eighth size. That's how I started." "I took lessons from my father for 13 years," she said. "When I started, it was the early '60s. Then the Cultural Revolution started." Communist leader Mao Tse-tung's Cultural Revolution began in 1966, with the aim of destroying old customs, culture, habits, and ideas and replacing them with revolutionary new ones. Its effects on China's cultural and educational institutions were devastating. During those 10 years, schools were shut down; and "allowable" music was restricted to eight Peking operas approved by Mao Tse-tung's wife, Jiang Qing. Western music was off-limits, and many who had been playing and teaching it were jailed and tortured. The government-sponsored persecution drove some 10 professors from the Shanghai Conservatory to suicide, according to a number of sources. Estimations vary wildly, but most agree that millions were persecuted, tortured and killed in China during that time. In this environment, Weiling somehow defied the odds and learned to play the violin; but it wasn't easy. Her father had studied with a Jewish teacher from the Soviet Union, with amateurs, then later with Tan Shuzhen. Shuzhen, who was a performer, teacher and luthier, describes his own terrifying ordeal -- being locked away for 14 months in a basement closet, tortured and then made to work as a janitor -- in the Academy Award-winning movie about Isaac Stern's 1979 trip to China, From Mao to Mozart. "I had to hide to practice," Weiling said. "We had a basement, actually, a very small room, and I practiced very secretively. You had to draw the curtain and play in a dark room, using a mute. You could not let people see you practice, because they called it 'unhealthy music.' We had seven or eight 'red songs' from Peking Opera, and they were all that was played. That was the only kind of music that people were allowed to hear." Resources were scarce -- a kind of pre-Internet scarcity that is hard to imagine in modern times. "We had very limited material. We didn't have music. No music!" Weiling said. "There was no book store, you couldn't buy anything. Everything we had was from the people who came from the Soviet Union; it was very little." When a visiting musician from the Soviet Union would come to town with sheet music, "then three people would copy from it. People used pencil to copy this new music, and of course there were many wrong notes and wrong rhythms." They did manage to scrape together some etudes: Kayser, Schradieck, Sevcik, Mazas, Kreutzer, Dont, Dancla. The big concertos were much harder to find. Weiling still remembers when they finally found a copy of the Mendelssohn Concerto -- something they didn't even know existed until then. "Somebody managed to get a copy, I remember." Her father had a number of pupils, and the father of one little boy became their secret copyist. When a piece of music came into their hands, "the father would do all the copying for all of us, overnight," she said. "He didn't sleep, because he had to return this precious copy to somebody the next morning." "So this is how we learned," Weiling said, "with no recordings, nothing. No model we could learn from. It was very difficult situation during the Cultural Revolution." Her own family was being punished for her grandfather's connections as a classmate of Chiang Kai-shek's son. Weiling was an only child, and that was one bright spot for the family. Though China did not yet have its one-child policy, "if you had more than one child, somebody -- your brothers or your sister -- would have to be sent to the countryside." Some used musical study to avoid being sent to the countryside labor camps. "If you had a skill, you could audition for some army band," she said. "There was no serious symphony orchestra in Shanghai back then, in the late '60s, early '70s." The Shanghai Symphony, though it had existed since 1879, stopped playing Western music and played only the government-approved fare, while Shanghai musicians and professors of music were tormented by Red Guards. "It was a terrible time." Weiling was a sophomore in high school when Mao Tse-tung died and shortly later the Gang of Four -- which had been controlling all cultural and educational systems in China -- collapsed. "There had been no college students for 10 years, 1966 through 1976. So I was one of the very first college students, right after the Gang of Four collapsed," Weiling said. "It was a new era." "That's why I had a chance to audition for the Central Conservatory," she said. "I was enrolled at the Central Conservatory and became a college student in 1977, the exact year the Gang of Four fell apart." "Everything was different, but it was just the beginning," Weiling said. The Cultural Revolution had left a landscape largely scoured of tradition, knowledge and outside influence. When it came to recordings of Western music, "we had very limited records from the old Soviet Union -- old, scratchy vinyl records. But we knew Oistrakh, we knew Kogan, we knew of Heifetz and of course, Isaac Stern." In this context, Isaac Stern's 1979 visit to China was an earth-shattering event to musicians such as Weiling. "We could never have imagined that one day we would see the great masters, face-to-face, until Isaac Stern and the Stern family came to China," she said. "I was a sophomore, in my second year of college in Beijing. Since then, everything has been different." "It was revolutionary. Like a tornado," she said. She remembers watching Stern emerge from his car, with his family and his pianist David Golub, and a film crew in tow. "We couldn't believe what we were seeing, the moment he arrived, when he opened the car and he came out," she said. "Is this true? What is happening? Everybody was shocked, total shock." During Stern's visit, Weiling played for him -- she can be seen in the documentary From Mao to Mozart, playing an excerpt from Ysaye's Caprice after a Waltz by Saint-Saens. "I couldn't believe what was happening; it was too sudden, and too good to be true," she said. Stern's presence alone represented a tremendous change; but his performances and master classes in China also left a lasting impression. "Before his visit, we didn't know how a violin could sound, not until he showed us," Weiling said. "And it was, my goodness, incredible. You could hardly breathe when you heard such a beautiful sound, coming from the same instrument! We had no idea, because we hadn't been able to hear anything from the West. Our recordings were very limited. We heard Milstein's recording, but a very bad recording. To hear a violinist like this live? No, never. Isaac Stern was the first one, and it was like being in the desert for so long, and then all of a sudden -- water! A fountain!" She sighed heavily, describing it. "Gradually, we began to understand. Before, we knew only that we should play with the correct rhythm, no scratchy sound, be clean and accurate. Good intonation, clean, not so out of tune -- only those kinds of things," she said. "We didn't know about color, expression, interpretation. We didn't know about using different parts of the bow to make music." His visit also gave them a glimpse of what things might be like on the other side of the world. In Weiling's case, it planted an idea: to study abroad. When China adopted an open-door policy, allowing students to go abroad, Weiling took the opportunity. "It was very complicated," she said. "I was lucky because I had relatives in the States to give me financial support, to give the Chinese government all the paperwork they needed and just to ensure that I could survive in the States." In 1980, she came to the United States to study, first with Daniel Heifetz at the Peabody Conservatory in Baltimore, then at Juilliard, with Dorothy DeLay. "I was at Juilliard for three years, then I transferred from Juilliard to Manhattan School of Music, where I had Raphael Bronstein as a teacher. He was a living disciple of (Leopold) Auer. He was a great teacher and so much fun." Weiling stayed in New York for a while after graduating, freelancing. She won the Artists International Competition, among other competitions, and played in Carnegie Hall and in Avery Fisher Hall. 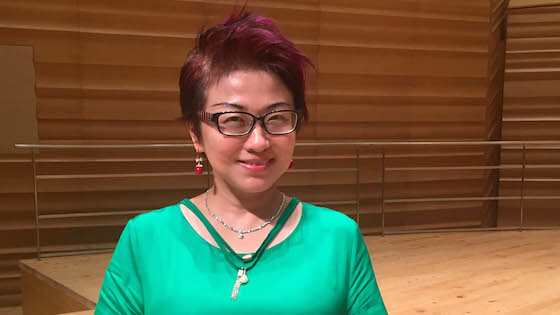 In 1993 she took a job as the first associate concertmaster of the Hong Kong Philharmonic; in 2000 she started thinking about teaching, and about going back to China. That year she was appointed Professor of Violin in the Central Conservatory in Beijing. More recently, in 2014, she began teaching at the Shanghai Conservatory. Weiling also has become a regular presence in international violin competitions, having served on the jury for the Queen Elisabeth, Tchaikovsky, Montreal, Sarasate, Menuhin and Shanghai Competitions, not to mention the upcoming Wieniawski Competition. Vera Tsu Weiling, at the Shanghai Isaac Stern International Violin Competition in September 2016. Having heard so many top-level violinists, she was pleased by the level of playing represented at first-ever international competition in her home town, the Shanghai Isaac Stern International Violin Competition, which and her husband, Shanghai Symphony conductor Long Yu, helped to plan. "We had this idea years ago," she said. "Shanghai is an international city. We have everything -- but not a serious, world-class violin competition. We thought, we must do something to make this international city more glamorous." The competition, named after Isaac Stern, brought the Stern family back to town and attracted competitors and jury members from all over the globe. For those pursuing the violin in China, it was an important moment. "Students don't have to go abroad to see a great competition, to listen to great playing and to see so many wonderful violinists," she said. "Now they know what the real international level is." Of course, the competition was streamed around the world on the Internet, but nothing beats the energy of an in-person event that brings together so many talented young people, expert jurors and interested audience members. "To have such a wonderful competition in your own country, this gives the students a sense of the bigger picture," Weiling said. It was a big event for musicians all around China, "not just in Shanghai and Beijing, but other cities: Sichuan, Wuhai, Shenyang, Xian, all the major cities, all the small and remote places. Young musicians are eager to learn something, this has been big for them, and for Shanghai. I feel this is something that has never happened before in China, and I hope it's going to be a big success. And this is only the first time. I hope people will come and join us for the future." September 30, 2016 at 06:50 AM · It is hard to imagine life without music, especially Western classical music. It's also hard to imagine learning to play the violin without knowing about "color, expression, interpretation. I am so impressed with Vera Tsu Weiling's commitment to learning to play the violin and to play it with artistry. Thanks for this remarkable interview, Laurie. Thanks also for your discussion of what happened during the Cultural Revolution. I had no idea that millions of people were persecuted, tortured, and killed. I am glad for the Chinese people that the long night without music is over. September 30, 2016 at 08:44 PM · Thanks so much for your wonderful interview, Laurie! Growing up in the same city during the same time as Vera, I feel that she told a story of many, many girls and boys in China back then. It wasn't so much that we didn't have music, it was that certain music was considered unrevolutionary therefore was forbidden. Thus, many of us had to go "underground" to access such music. Sure we had a tough time then, sometimes very tough, but we learned so much at a very early age too. Life is full of amazement for us and that's something to be thankful for. October 1, 2016 at 05:49 AM · Hi Frieda, it's always an issue with Chinese names! Vera's is a bit of a hybrid; she did not have a problem with the way I used her name. October 1, 2016 at 12:36 PM · Laurie, you addressed in a friendly way. That is certainly not a problem. Great interview with such a talented and lovely woman. Thank you for bringing us Ms. Tsu's life story. It is heart-warming and touching. She must be an extraordinary person and musician.